Send your friends and family personalized greetings of the season with a fun retro holiday card. 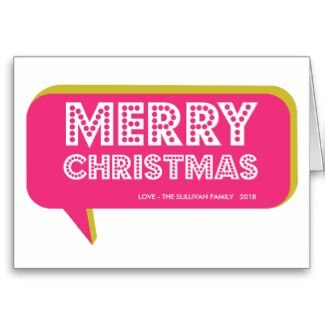 Whether you go for a good old-fashioned Christmas card or you prefer a Seasons Greetings or Happy Holidays theme instead, you'll find the perfect design to match your needs. Each of our high quality, completely affordable vintage look cards comes complete with an envelope and a 100% satisfaction guarantee. So, what are you waiting for? Browse through our handpicked selections and order yours today. Christmas will be here before you know it! 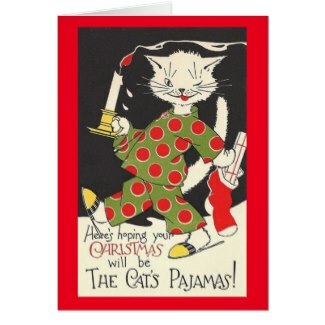 Fun & unique Christmas card features a vintage image of a cat wearing pajamas that says; Here's wishing your Christmas will be the cat's pajamas! 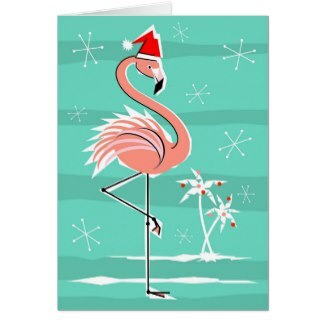 This retro Christmas card features a fun flamingo wearing a Santa hat and standing in front of a couple of Holiday decorated Palm trees. 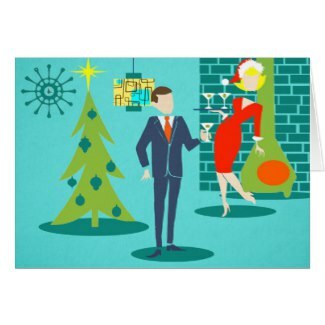 Design features a cute mid-century style illustration of a couple celebrating Christmas with martinis in front of the tree and fireplace. 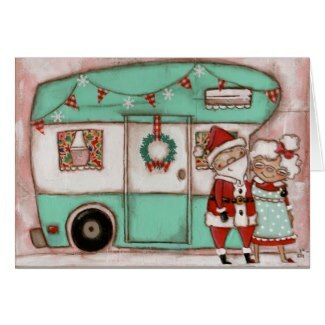 This adorable Christmas card design features Santa and Mrs. Claus standing in front of a Holiday decorated retro style camper. God bless us, everyone! 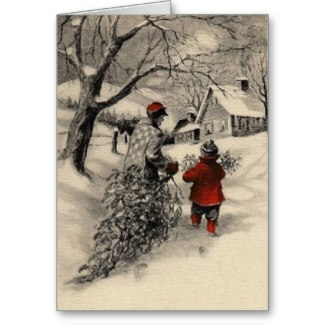 This holiday card features a lovely vintage illustration created by Harold Copping of Tiny Tim and his father from 'A Christmas Carol'. Vintage illustration by William Roger Snow from 'The Night Before Christmas' of Santa in a miniature sleigh and eight tiny reindeer. 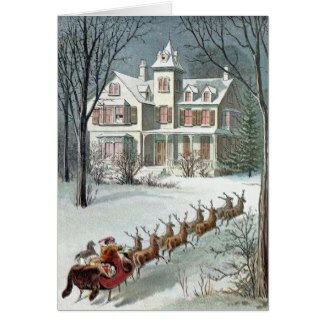 This stunning Merry Christmas card features a vintage illustration of a reindeer and sleigh by Charles Robinson from ​'The Happy Prince and Other Tales'. 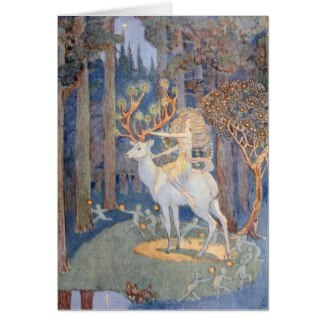 Holiday card features a beautiful Jessie Bayes illustration of 'The Erl King's daughter with her faery servants in a magical forest. 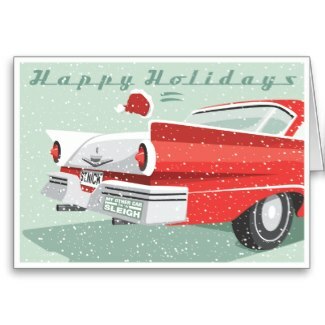 Classic car lovers will be delighted to receive this hot rod holiday greeting card from you. Customize the inside to say whatever you like. 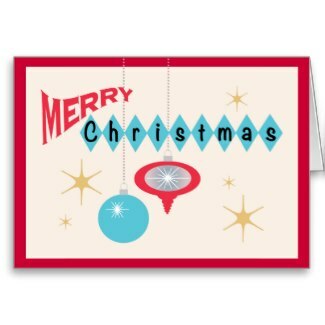 This retro Christmas card is right out of the 1950's with a cool font and Christmas ornaments. 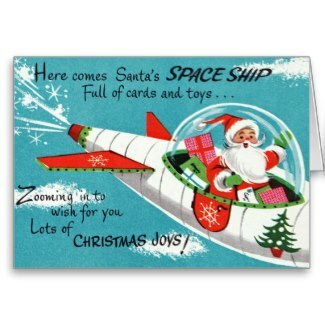 Santa has skipped the reindeer in favor of a spaceship on these cute retro Christmas cards. Customize them to share your personal message. This 1980's pink retro Christmas Card has a cool talk bubble. Personalize with your family name. 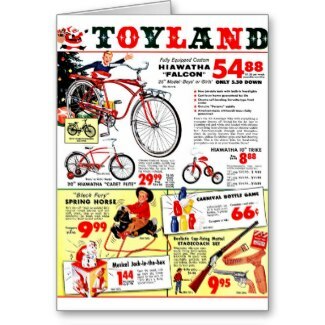 This vintage style Toyland Christmas card takes you back to a time of wonderment when catalogs were king. Beautiful retro/vintage image of a fresh cut Christmas tree being taken home for the holidays. Customize them with your own personal message. 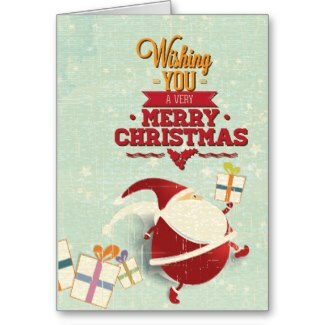 Customize this adorable retro Santa Claus card with your own holiday well wishes. 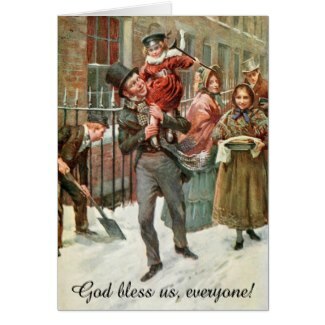 This beautiful vintage holiday card with victorian child and cat will delight your family and friends. 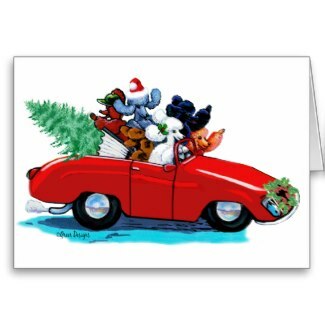 A whimsical holiday card that features a red sports car filled with poodles and Christmas spirit. Says Merry Christmas inside. 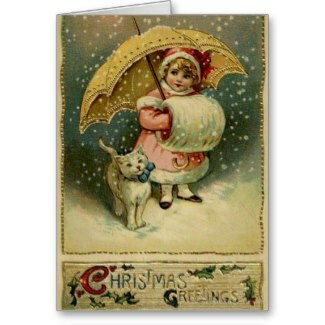 Add your own photo to this Retro font Baby It's Cold Outside Christmas Card. 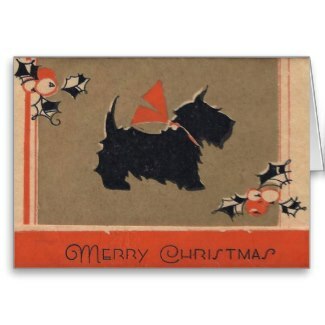 Wish everyone a vintage Merry Christmas with these cute art deco style cards that feature a black Scottie dog with a big red bow. 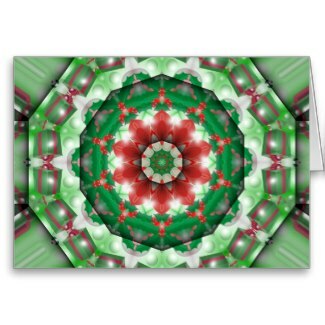 You're family will love this retro 70's groovy kaleidoscope Christmas card. Personalize the inside with your name and message. 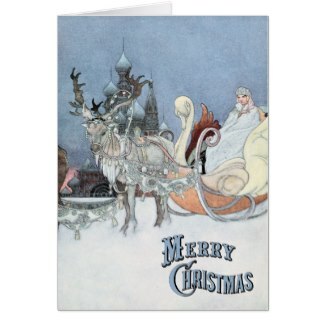 There are a lot more fun vintage and retro style holiday card designs to see!